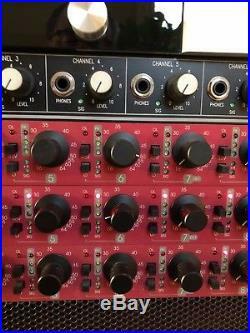 Very gently used, amazing deal for 8 high quality preamps so don't miss out - plus you get one M+S matrix - how can you go wrong at this price!! The Precision 8 is designed to provide the detailed, transparent sonic performance necessary for the highest quality direct tracking and live sound applications. It includes a unique combination of features which make it useful as a complete input system for MDM's, HDR's, and DAW's. Two sonically accurate discrete FET instrument inputs (DI's) are available for recording or live sound applications in which realistic, unaffected sound quality is desired. The 5-segment peak-hold level metering with selectable peak reference allows rapid optimization of program levels between the PRECISION 8 and devices to which it is interfaced. 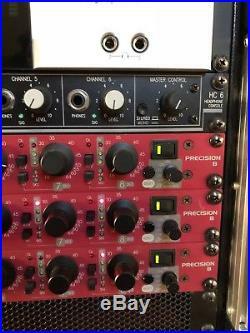 PRECISION 8 is ideal for location recording due to its 8-channel single rack unit format, smooth continuous gain controls, useful level metering, and easy interconnect. The integral MS decoder provides creative spatial image control that is particularly useful in attaining an exciting stereo image with minimum effort and microphone repositioning. 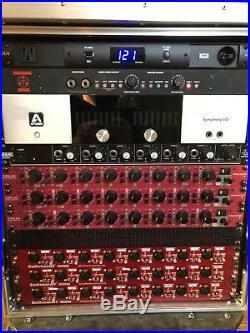 Eight highly transparent solid state microphone preamps in a 1 unit rack configuration. Challenges the recognized leaders in sonic accuracy and performance. Built-in M-S (Mid-Side) decoding for creative spatial image control. 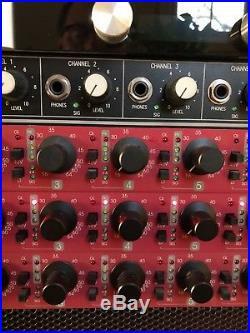 Active, high-impedance instrument inputs ("DI's") selectable on two channels. 5-segment level indicators with peak-hold feature and selectable peak reference. Easy interface to MDM's, HDR's, DAW's, or consoles. Dual DB25/TRS outputs for flexible interconnection. Exceptional cost per channel value. 1.5 Hz to 500 kHz (+0/-3 dB). THD (+26 dBu, 100 kOhm). 120VAC, 60 Hz, 44 Watts. 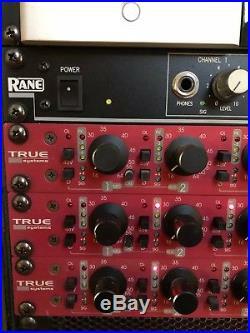 The item "True Systems Precision 8 8-Channel Microphone Preamp Mic Pre" is in sale since Monday, April 02, 2018. This item is in the category "Musical Instruments & Gear\Pro Audio Equipment\Preamps & Channel Strips". The seller is "amadmozart" and is located in Chagrin Falls, Ohio. This item can be shipped to United States.